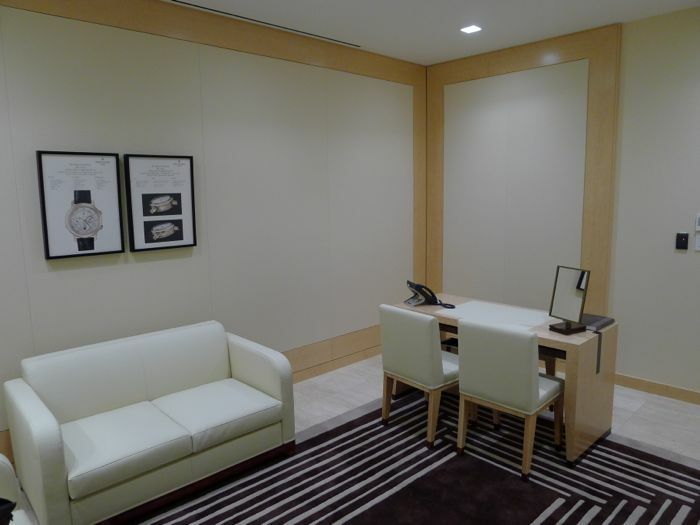 In early 2013, The Henri Stern Watch Agency, Inc. (“HSWA”), the U.S. subsidiary of Patek Philippe SA, moved from 1 Rockefeller Plaza to a new office at 45 Rockefeller Plaza. 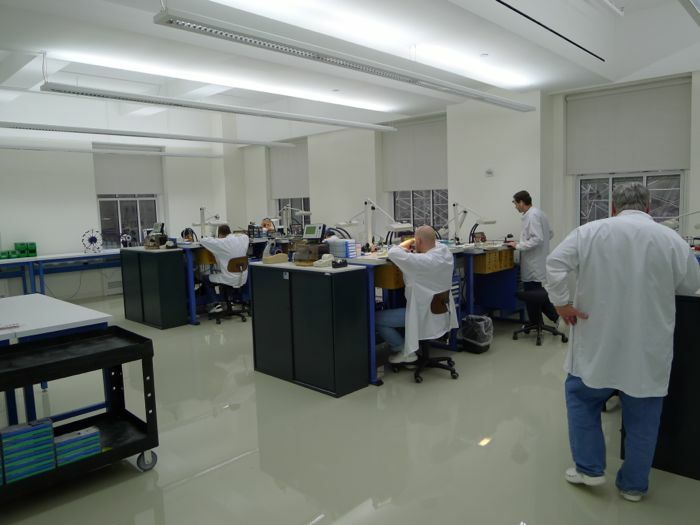 The new headquarters are nearly 33,000 square feet and consolidate a state-of-the-art watchmaking workshop with the administrative offices of Patek Philippe USA. This is an important investment for Patek Philippe and demonstrates its long-term commitment to the U.S. market. Furthermore, it is also a commitment to New York City’s Rockefeller Center, a complex where HSWA has been located since the late 1930s. TimeZone was invited to visit the new offices and we brought along a camera. 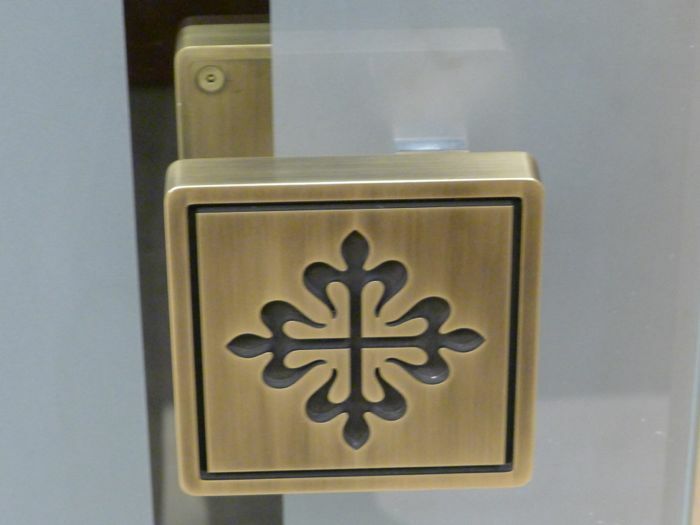 The lobby is a tasteful combination of marble, light blonde wood and brass. 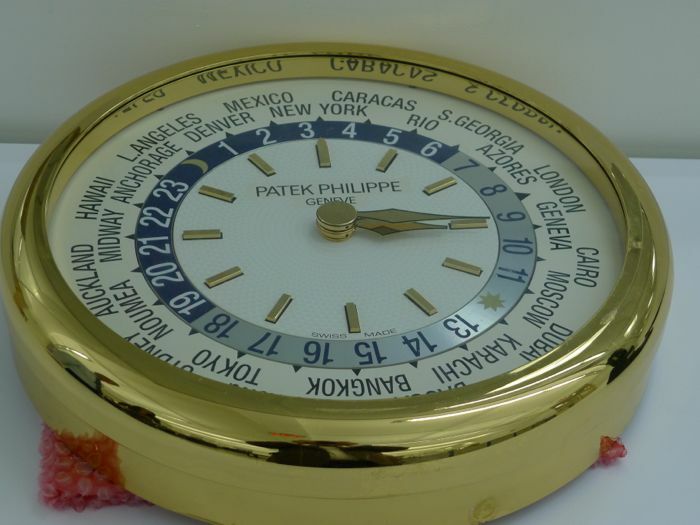 The attention to detail is exquisite and in harmony with the Patek boutiques. 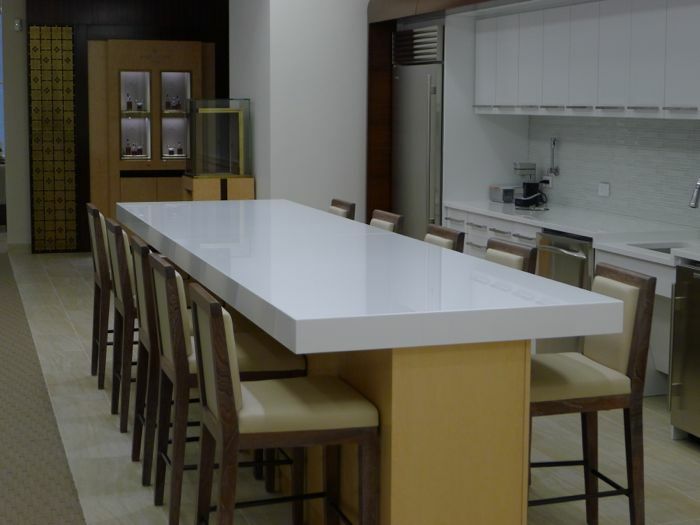 Customers are welcomed in a private salon where they can privately bring their repairs. Notice the Sky Moon tourbillon drawings on the wall. High technology was not forgotten. 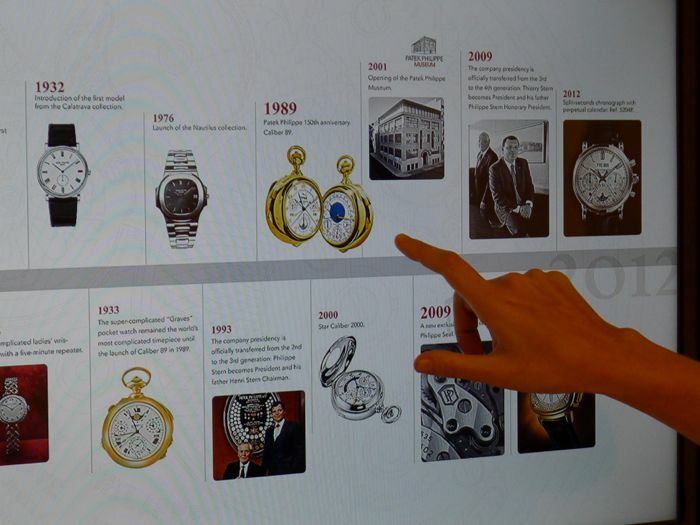 There are interactive walls in the reception area where customers can read about the history of the brand, look at the catalogue or watch a live-feed of repairs directly from the workshop. 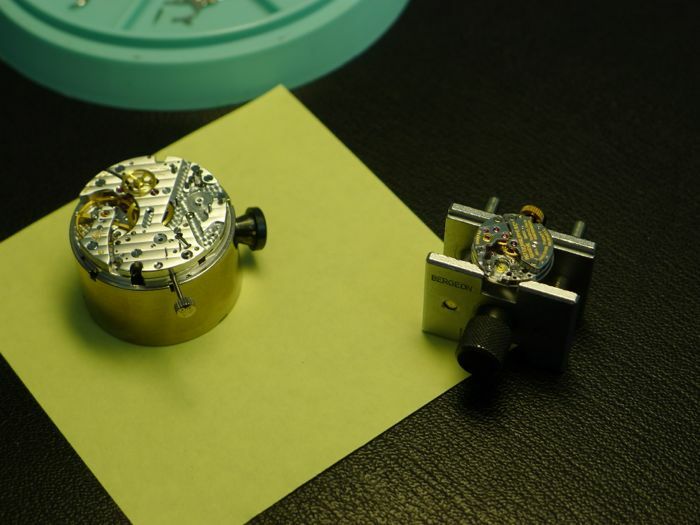 There is a camera that feeds images from a watchmaker working on a Grande Complication. Also the reception area is appointed with iPads for customers to use. 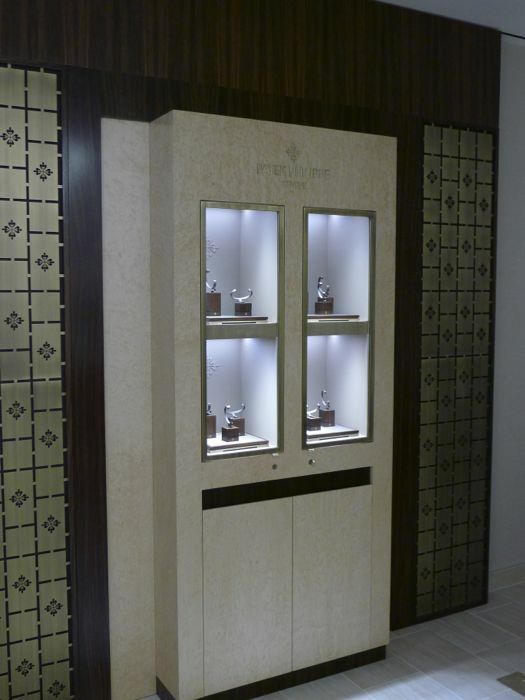 This display case is used to show retailers what a Patek Philippe Corner looks like. They can have a feel for the colors and dimension needed in the store. They can also see the watch stands inside each window. We leave the administrative side to follow a long corridor. 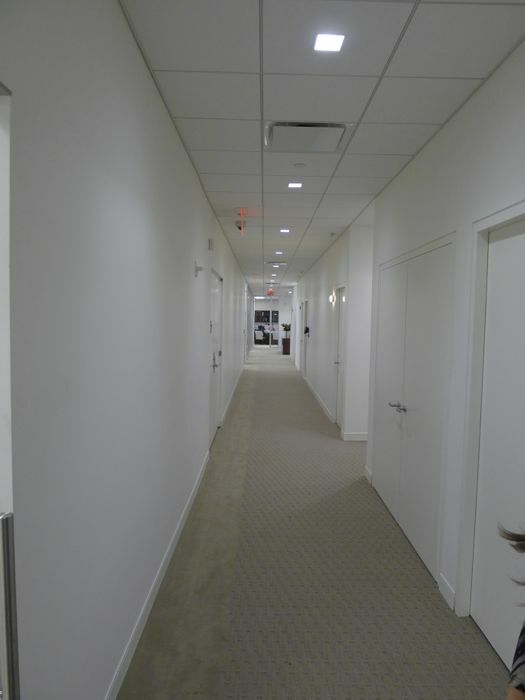 Notice that the walls are bare because the staff have yet to install artwork. We reached another kitchen (yes they seem to be bon vivants at HSWA), but this one is mainly for watchmakers. 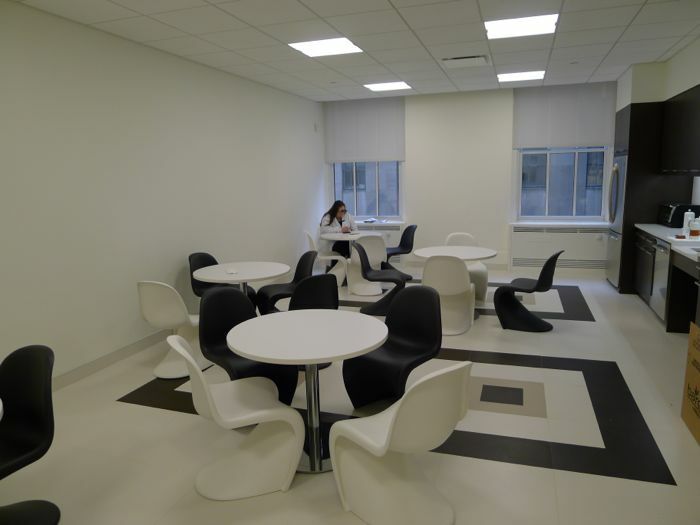 We loved the furniture in this room, a retro 1970s futuristic modern décor. The perfect kitchen to wear a Nautilus. Then, we prepared to enter the watchmakers workshop. The setup is similar to a hospital operating room. 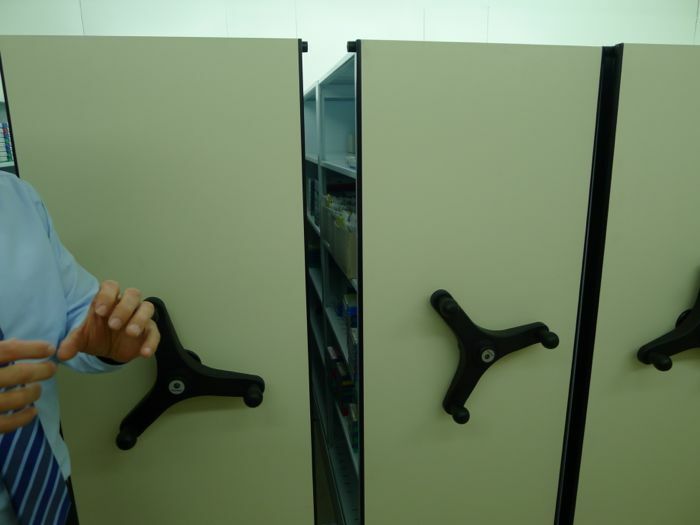 A hospital tries to prevent microbes from entering the operating room, whereas the watchmakers try to prevent dust particles from entering the workshop. 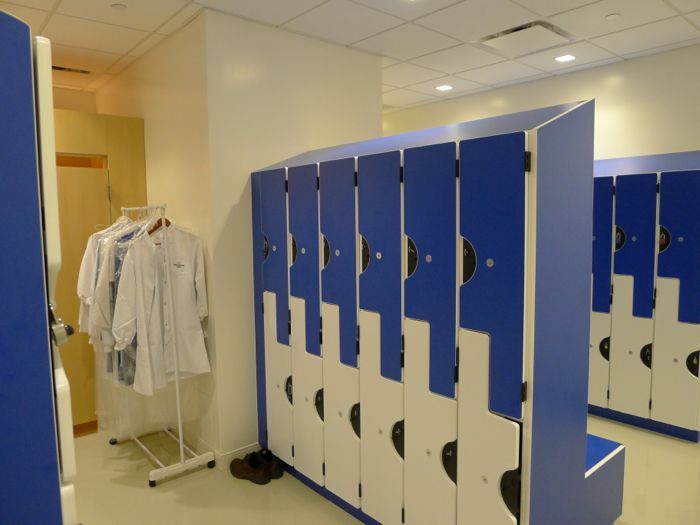 These are lockers for the watchmaking staff and you can notice the white coats that are needed to enter the room. Also, guests must wear shoe protection. 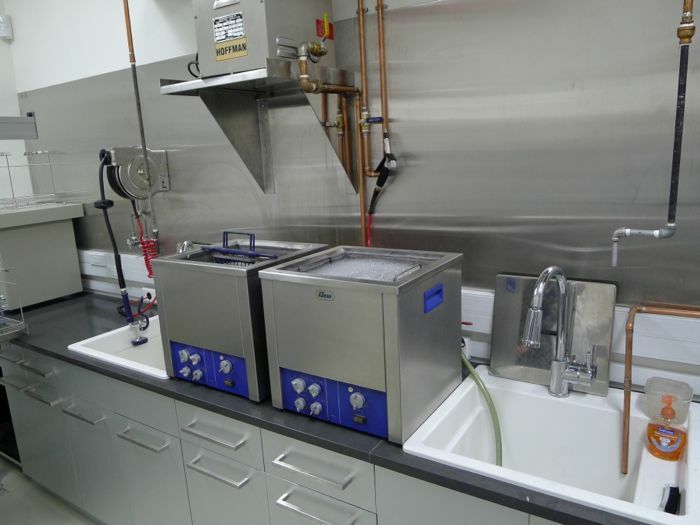 HSWA has dual air controls for both the watchmaking workshop and the administrative offices. 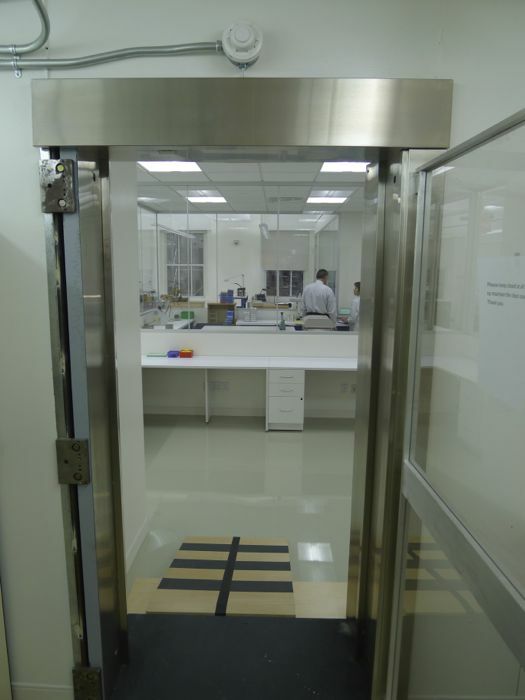 There is an air filtration system and also an air pressure system to make the watchmaking area a higher pressure room to prevent external dust from entering. Within the watchmaking area is the polishing and watch cleaning department, which is obviously separated from the rest of the atelier. It has large open windows. No detail was left unchecked. 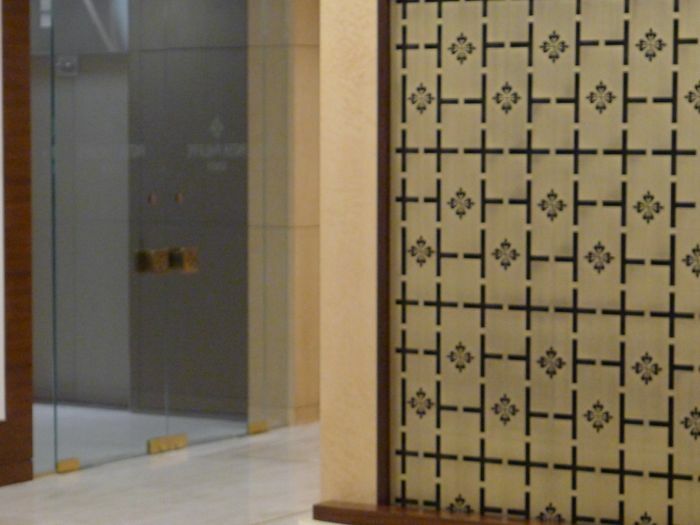 Patek even poured flooring with an antisatic surface with rubberized properties. Here, a polisher is working at an extremely clean station. You would barely notice any dust even in this room. 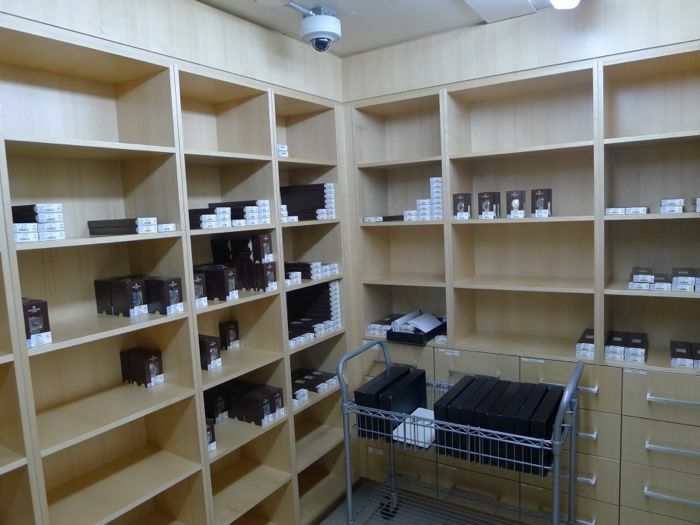 In the adjacent room, you can find the cleaning and sonic machine for watch and movement parts. 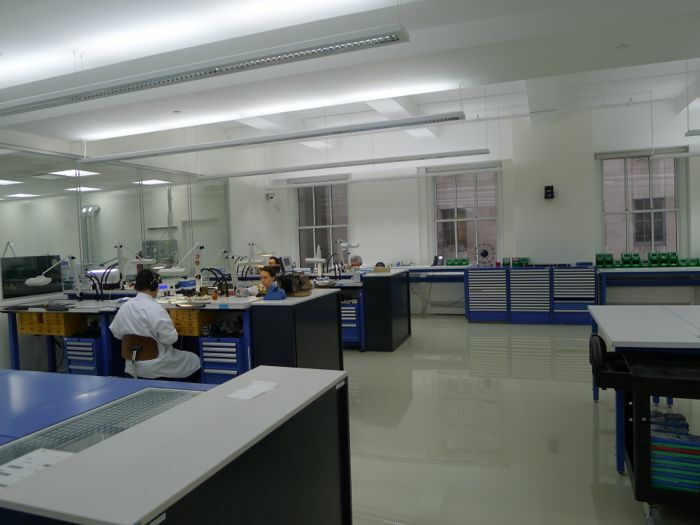 This is the main watchmaking area, with a few stations. There are 8 watchmakers and the room can accommodate up to twice as many. You will notice the ease of space and the comfort of the room. The room was designed top to bottom as a watchmakers workshop. The Quality Control area has its own separate staff. 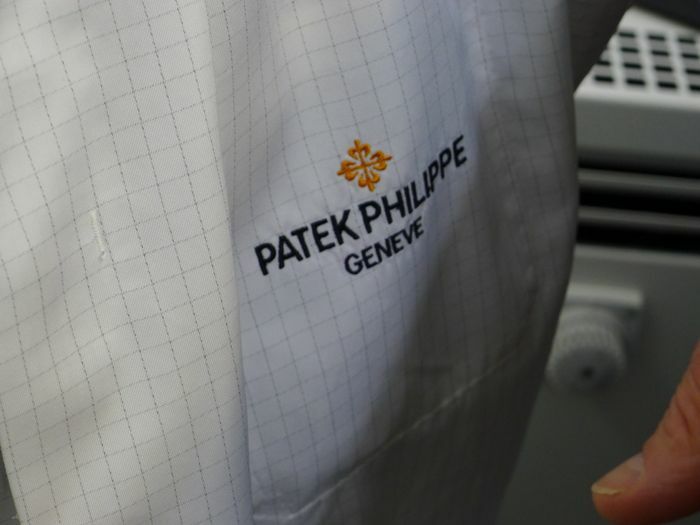 The staff have state-of-the-art equipment to make sure your Patek Philippe watch repair meets the exact standards as a similar repair would achieve in Geneva. The entire room was as quiet as if I was visiting an atelier in a Swiss Village. In the background, the windows overlook Fifth Avenue, one of the busiest and noisiest street in the world. Yet, inside, you can literally hear a pin drop. 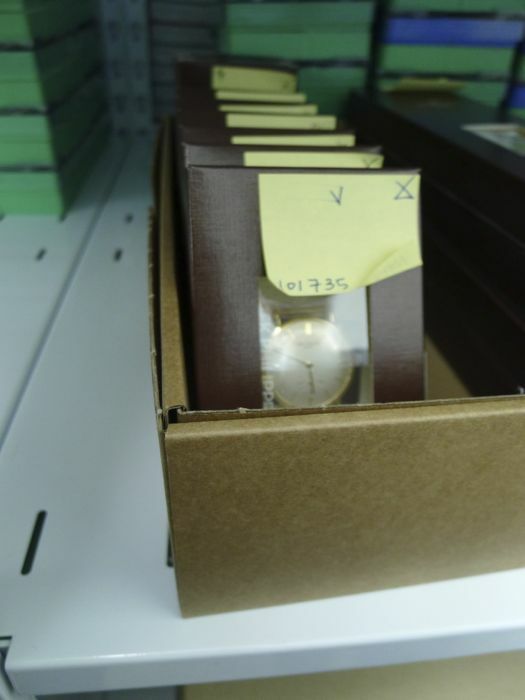 HSWA can handle most repairs, except the Grande Complication watches are sent back to Switzerland. 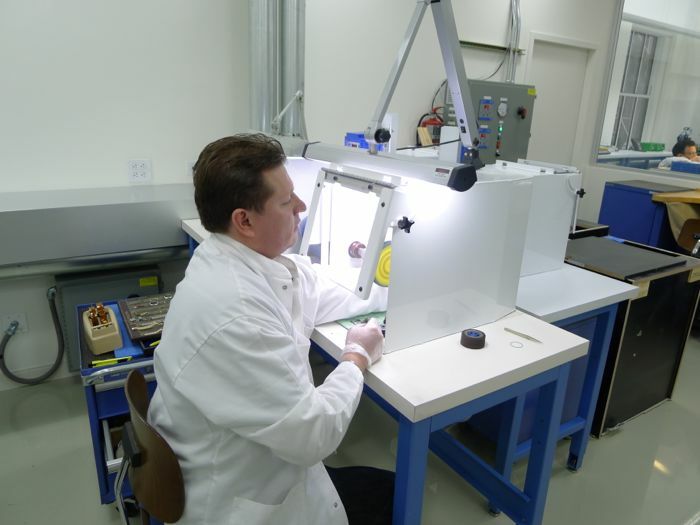 HSWA does some vintage watch repairs, but only about 60 pieces a year. Notice the World Timer world clock, above. In the second picture, notice the small ladies movement on the right and a 27-70 fitted in a 5070 on the left. 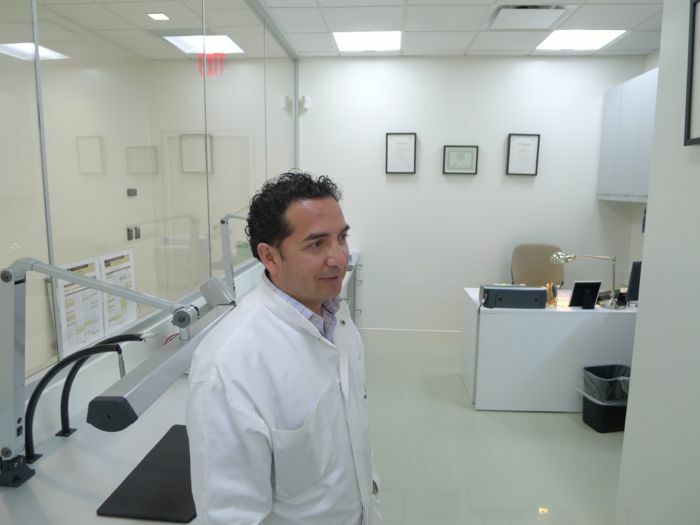 The watchmakers seem to enjoy the new atelier, a big difference from their old digs. Entering the repair safe room. The large walk-in safe has two entrances; one from the watchmakers’ atelier and another for the corporate staff. The safe is attached from the ceiling. Plenty of storage space for your repairs. There are also parts that will be used to repair the watch. Finally repairs that have to go to Switzerland are also stored in the safe before delivery to the client. 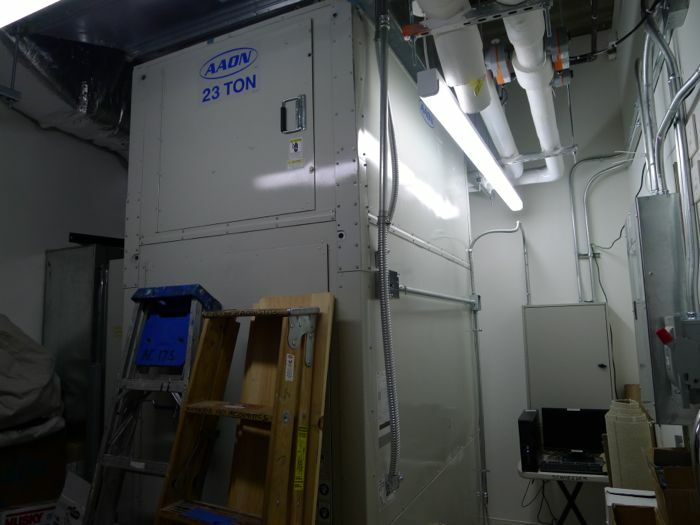 Another safe within HSWA New York. 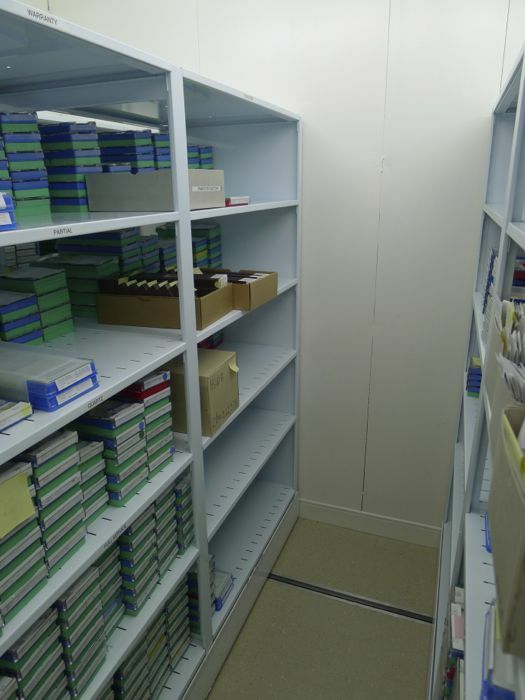 This is the room where new watches are stored before they are shipped to authorized Patek Philippe Agents. You will notice the very limited inventory. 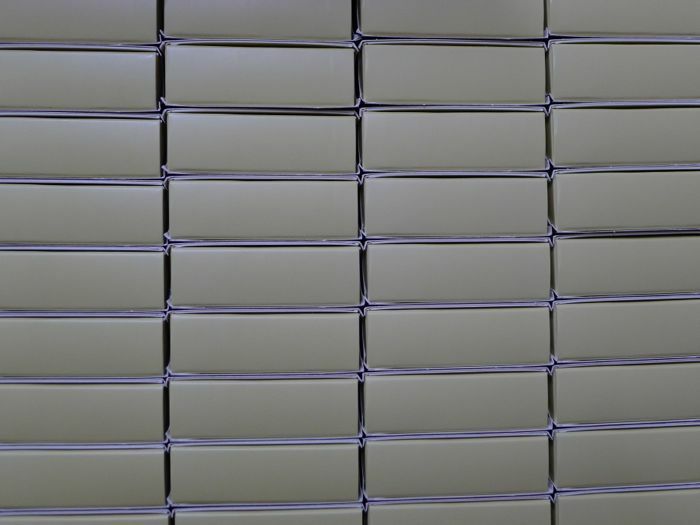 The famous shipping boxes used by Patek for their sealed watches. 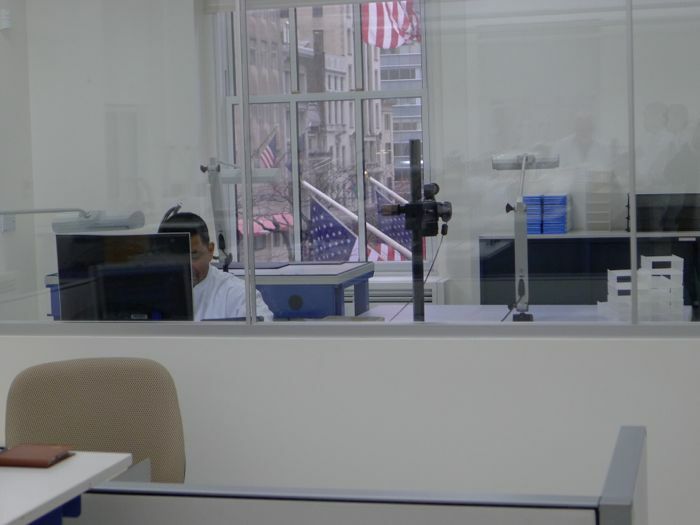 To conclude, Patek has created a state of the art facility in the heart of New York which cannot be rivaled. 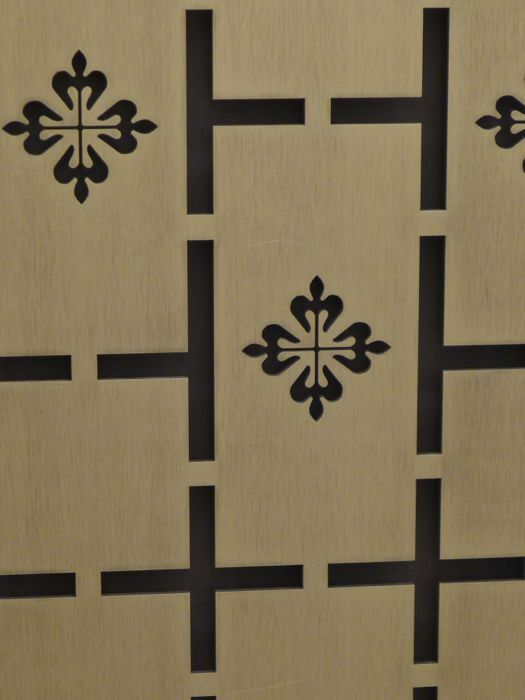 The investment was important and is testimony of its engagement to excellence, as well as maintaining tradition. 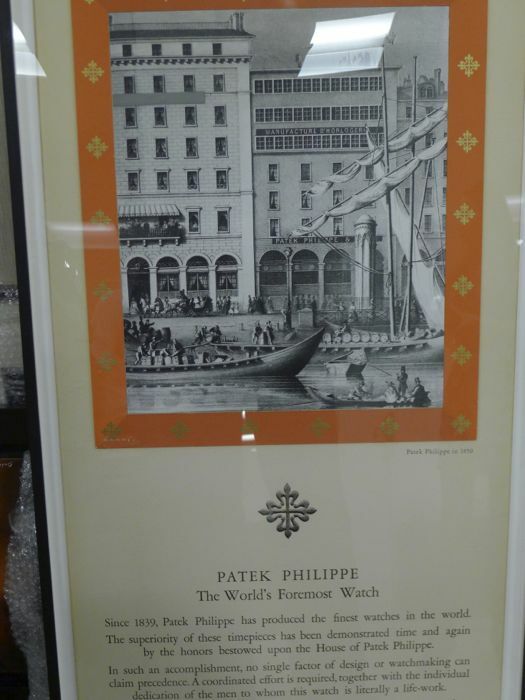 After 80 years in the Rockefeller Center, Patek Philippe chose to stay there and worked around the difficulties of installing such an office and atelier when the easier and cheaper route would have been to delocalize. The company deserves kudos for this long term commitment, the mark of true understated luxury.